Adventure may be the name of the game in Costa Rica, but not all tours are created equal. On a scale of tame to terrifying, most of the country’s adventures fall somewhere in the range of adrenaline rush, not adrenaline deluge. For the faint of heart but adventurous in spirit, Costa Rica serves up a smorgasbord of tame-but-thrilling tours, like canopy ziplines, class II-III whitewater rafting, ATV tours and suspension bridges. These activities guarantee an adrenaline rush—and a ton of fun—but won’t scare the socks off you. That is, except when it comes to Costa Rica’s most extreme adventures. This country can dish up some of the most exhilarating and heart-stopping experiences that the world has to offer! These tours are safe—the country enforces very stringent safety requirements—but you’ll feel anything but secure as you rappel through the interior of a strangler fig or belly-crawl through caves as old as the dinosaurs. Ease in with whitewater rafting on a class III-IV river, or up the ante with big daddy class V rapids; jump down into the abyss on wet-and-wild waterfall rappelling tours; and round out your entrée to Costa Rican adventure with one of the nation’s most extreme canopy tours. Next up, seriously intense adventures like cave spelunking, ultralight flights, bungee jumping and rock climbing. Picture this: Your ankles are tied to a bungee cable, and you can just make out the roar of a river far below. Your friends are chanting your name. You may even be bound to one of those friends to tandem jump. And you’re standing on an old bridge, staring into a 265-foot abyss. (Reality check: You’re teetering more than 26 stories above the ground.) Now jump! Or this: You’re mid-dive down a waterfall in a lush, rainforest canyon. Class IV or V rapids churn around your raft and you have to hang onto your paddle so the river’s rocks and frothing whitewater don’t wrench it from your grasp. You’ve already tackled demonic rapids like “Dirty Mind,” “The Abyss,” and “Indigestion,” when your guide warns that “El Horrendito” (the little terror) is looming on the horizon. Hold on to your paddle! And now this: The tug of the boat pulls your body forward and you can hear the wind whipping through your parachute. Just as you think “I’m not ready for this!” your feet leave the sand and you’re airborne. The coastline slowly fades to distant scenery and you realize you’re parasailing 600 feet above the Pacific Ocean. The only thing between you and the sparkling sea are a handful of birds—but you soon leave even them behind, as you fly up, up, up toward the wispy, cotton-puff clouds. Whatever your adventure fantasy, these tours are sure to get your heart pumping and your mind racing: they’re an exhilarating thrill ride through the best and most beautiful that the country has to offer. Welcome to extreme, Costa Rica-style. Do you dare? Costa Rican spelunking doesn’t get the fame it deserves—and that’s a great thing for cave junkies who yearn to explore the unexplored. With one of the largest cave systems in the Americas, the country does not lack for sparkling stalactites, meandering underground rivers and fantastical cave formations. Venado Caverns, near Arenal, is a semi-developed caving destination, with caves that are 10-15 million years old and that feature impressive formations, like the Altar Room and Giant Papaya. For less touristic spelunking fun, head to Barra Honda National Park (near Nicoya), where you’ll descend into a below-sea-level abyss to explore caves that began forming 70 million years ago. There are no paths or handrails here—Barra Honda is pure, rugged spelunking. For true adrenaline junkies, canopy tours can often feel too docile. But don’t worry: there are several ziplines in Costa Rica that are fast enough, long enough and extreme enough to curl your toes. Look for tours that involve Tarzan swings (free-fall from a platform), Superman ziplines (soar belly-down, like the Man of Steel), tree rappelling, rock climbing, mini-bungees, or the option to ride upside-down. 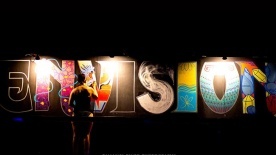 A spectacular location, like over waterfalls or by an active volcano, also lends thrill. Some of the best, most extreme canopy tours are located in Arenal (up to 60 mph! ), Rincon de la Vieja (rock climb a river canyon!) and Monteverde (nearly 600 feet off the ground!). You have two options for bungee jumping in Costa Rica: the Colorado River Bridge near Alajuela and a bungee/extreme machine in Jaco. Bungee purists prefer the Colorado Bridge jump, which has been perfecting its awesome jumps for more than 20 years. In Jaco, a manufactured bungee free-falls 130 feet and includes a water touchdown, if you’re so inclined. The Jaco facilities also offer night jumps, a rocket launcher (think human catapult—you’ll go from 0 to 60 mph in about 3 seconds!) and a giant swing. In Monteverde, a canopy tour also offers a 470-foot jump from an aerial tram. If you’ve ever dreamed of flying like a bird, you’re going to love this awesome activity. In theory, parasailing is simple: harness up, attach a parachute, connect to a speedboat, and up you go! In practice though, parasailing is much more thrilling—you’ll soar hundreds of feet above the ocean, a thin cable your only tether to the world below. With the wind in your hair, your legs dangling over a 600 feet of open air, you’re treated to the nation’s most spectacular views. It’s an incredible, exhilarating experience that you can have over the sparkling Pacific and powdery sands of Manuel Antonio and Playas del Coco. Rock climbing is an emerging adventure sport in Costa Rica, which means you can get in on some truly awesome, rugged climbs. Organized rock climbing tours are few, but there are several groups and a few property owners that have organized to discover Costa Rica’s best climbing rocks. Rope-climbing is hot in Cachí, a small town outside Cartago, while bouldering (ropeless climbing) is growing in the mountains and valleys near Chirripó, Cerro de la Muerte and San Gerardo de Dota. Dragon Mountain, near Manuel Antonio, is a scenic and challenging choice, as well. A guide is necessary to find the best climbing rocks. It’s the ultimate fantasy—an adventure in three dimensions. Board a tiny two-seater “ultralight”—a lightweight, fixed-wing aircraft—for an extreme (and extremely beautiful) sightseeing adventure. You’ll feel as light as air on this open-air flight, and will enjoy the adrenaline rush as panoramic vistas unfold before your eyes. The best part of this extreme adventure is its scenic byproduct: beautiful views that will be forever embedded in your mind (and camera memory). Ultralight tours depart regularly out of Samara, Tambor, and Uvita. If you’re looking for the ultimate adventure—and a quintessential Costa Rican experience—you have to try your hand at waterfall rappelling, also known as canyoning. Harness up, check your carabiners and belay down! You’ll scale the mossy cliff face as a roaring waterfall cascades over your shoulders, spitting cool mountain water into your face. 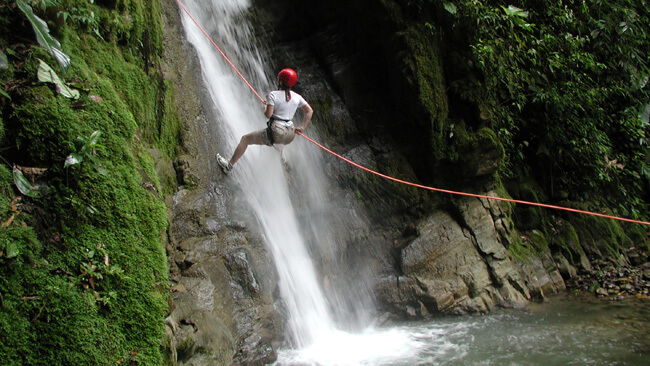 For the biggest adrenaline rush, choose rappelling tours that scale 180+ foot falls and incorporate horseback riding, ATVs and other exciting methods of transportation; Los Chorros (in the Central Valley) and Arenal are great choices. 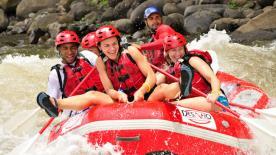 Epic—that is the only way to describe whitewater rafting in Costa Rica. The country’s rivers are legendary and the world’s most passionate paddlers make it their mission to navigate Costa Rica’s freshwater waves at least once in a lifetime. You’ll find class III-IV rapids (and tours) on many rivers, including the Río Toro, Río Sarapiquí, Río Peñas Blancas, Río General, Río Cucaracho, and the Río Naranjo. But if you’re in search of pure, unadulterated and totally extreme whitewater, head straight for the incredible class IV-V rapids on the Pacuare (near Turrialba), Reventazón (also near Turrialba), Upper Balsa (near Arenal) and the Cucaracho (Rincón de la Vieja). * Please note that we do not offer these tours directly.